You can order any of our house signs as a Christmas gift for someone without committing to a font (letter style), colour, or layout. Simply order the sign with what you think they would like. We will then create and send a personalised Gift Certificate as a PDF attachment for you to print out. It will show a proof of the house sign you have chosen for them with a personalised Christmas message of your choice. The recipient can the either approve the proof or ask for any alterations in font, colour or layout. There is no charge for this service. 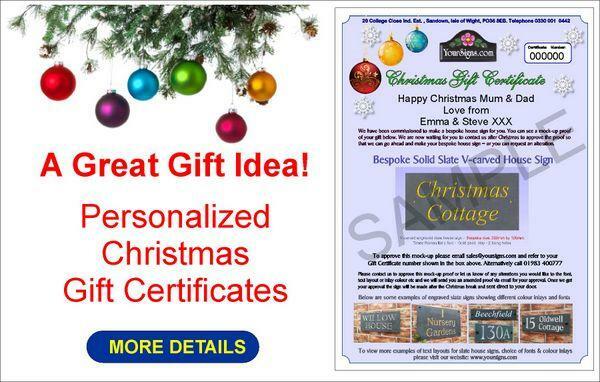 If you decide you would prefer to order a house sign as a Gift Certificate for your recipient to approve, please put the wording ‘Gift Certificate’ in the ‘any further instructions?' box when you place your order. Also add your personalised Christmas message to the same box. We will then create the Gift Certificate as a printable PDF file for you to print out and send it to your email. The sign will be made once your recipient contacts us to go ahead and make the sign after the Christmas holidays.